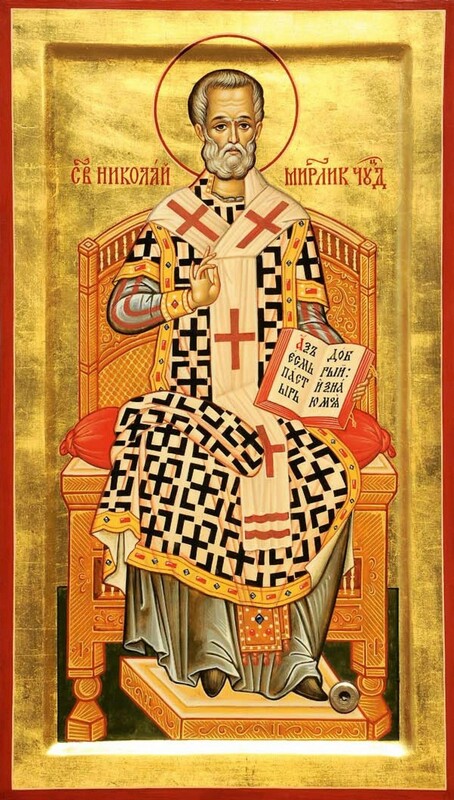 St. Nicholas the Wonderworker has been revered by people all over the world for seventeen centuries now. As time goes by, the veneration of St. Nicholas does not decrease. Especially among Russians, he is loved now like never before. Here in Russia there are thousands of churches and side-altars dedicated to him, where people turn to him for help for various needs: before travelling, before making an important purchase, for family happiness. People read akathists to St. Nicholas and have recourse to him as a speedy helper and intercessor before God, calling him a "wonderworker." He is called a God-pleaser because he so pleased God, and a wonderworker because God gave him the grace and blessing to work miracles. God chooses such saints and gives them a special gift. Why does this happen? Why is it not the same for each saint? We do not know the answer to this question and we will probably never know it. And there is no need to know it. We know that a certain hierarchy exists in the heavens, among the angelic powers as among people on earth; and there is also a hierarchy among the saints. Throughout St. Nicholas's historical life, not only here on earth but even in the heavens, he has occupied a very high rank in this hierarchy. I often think to myself, "miracles . . . ." We have seen many miracles in our lives, but we do not always ascribe any particular meaning to them. But as time passes, we look back and think, "Yes, that is how it was; it was not for nothing." The Lord was leading us along a path that leads to salvation, but we complained, lost heart, doubted in our own strength, in God, and in His help. But in hindsight we see that it was all for our salvation. But St. Nicholas never doubted. He simply gave himself over entirely to God. He became a "rule of faith and model of meekness" even to his contemporaries, as well as to their descendants, and all future Christians. When we call him a wonder-worker, it means that we expect miracles from him. We should be thinking more about the salvation of our souls, but instead we think about how to make this life better for us. Of course that's sinful, it's not the right way, but at the same time we cannot deny this life. We need to build our lives in a way that is pleasing to God, and therefore we ask St. Nicholas to help us to overcome specific difficulties. However, St. Nicholas is not just a wonderworker, quickly answering our prayers and sending us help. He also has zeal for the faith; that is, he also expects us to meet a high standard. We remember how at the First Ecumenical Council St. Nicholas struck Arius, who had blasphemed God and did not accept Christ as true God, saying He was created. No, St. Nicholas could not restrain himself, and he was even put in prison for that. Even his own brother bishops of the council condemned him for it. But that was his zeal—he could not restrain himself. As a human he could not restrain himself, but as a holy hierarch and good pastor he was concerned for his flock, and he prayed about it. That happens sometimes with saints. In the historical context this example shows us that we need to resist and show opposition to those who blaspheme God and persecute the Church. This we do through our prayer, and our own firm faith. God has granted me in my life to experience many miracles of St. Nicholas, some of which I have written about in my short stories. But there is one incident that shook all of Russia over fifty years ago in the city of Kuibishev, now Samara. This was an event that occurred with the girl, Zoya. Many of you already know about this—another miracle of St. Nicholas. A group of young people gathered for a New Year's Eve party and Zoya's boyfriend, Nicholas, did not show up, so she took down an icon of St. Nicholas from the wall and started facetiously dancing with it instead, saying, "This will be my dancing partner!" She started circling around with the icon, and on the third circle this miracle happened. All heard a thunderclap, saw a flash of lightning, and the girl froze with the icon in her hands. She became like stone. I have many acquaintances who were witnesses to this miracle; I myself lived in Samara, and know one person who saw her standing there, covered with a sheet. I even had a prosphora baker whose brother was at Zoya's funeral. In other words, there is no need to doubt that this really happened. The point is this: Why did St. Nicholas decide to strike this girl? Not because she insulted him personally, but because she was laughing at something holy, and St. Nicholas was showing us by this miracle that we must not laugh at holy things, that this is very dangerous for people. She froze, turned to stone. As we know from the rest of the story, St. Nicholas himself came to her. The police who were guarding her house to keep people from seeing the miracle said that an old man kept coming and they would chase him away, but he somehow went in anyway and said to Zoya, "Well, are you tired of standing?" After this she returned to life. Then the man disappeared, and when asked about him the police just pointed to the icon and said, "There—he looked like him." So, St. Nicholas himself delivered her from this state. But he showed her by this that a terrible punishment comes from laughing at or mocking holy, divine things. We often do this out of ignorance, but if it is a conscious act directed against the Church, against God and His saints, a blasphemy against the Holy Spirit, it can even be punishable here on earth. There are innumerable examples of this in life. This miracle happened in the 1950's, just at the time when Kruschev's persecutions against the Church were beginning, and St. Nicholas showed this truth even to the godless, because they could not explain it away. They tried to do so by supposing that it was it was a trick of nature, but they were nonetheless scared by it. Thanks to this incident none of the churches in that diocese were closed during the Kruschev persecutions, although churches elsewhere were being closed. And all those churches that were reopened during World War II remained open. Young people put on their crosses and people came by the thousands to be baptized. Baptisms were performed even on the streets for lack of space in the churches. Thus did St. Nicholas with this miracle bring many people to their senses and back to the faith. You see, every miracle happens for a reason; they are not magic tricks done only to amaze people. They are for the purpose of transforming individuals, so that they might abandon their sinful lives and begin to live a pure, bright, Christian life. That is why miracles happen. Sometimes we ask for something but we don't get it. Why don't we get it? Because we don't need it. But we don't know that; we think that we only need to obtain this or that and we will be happy. Well, we won't be happy. We may even become more unhappy. We often act like unreasonable children asking their parents for chocolate, which is not good for them, and when they don't get it they are upset and take offense. We do the same thing with God—we ask for something we think we need, but the Lord knows that it will be our ruin. So let us know brothers and sisters that not all our prayers to St. Nicholas will be answered—not because he doesn't hear us, but because he knows that it might be ruinous for us; even worse, it might destroy our souls. Therefore, if God sends us some kind of trial, let us be like Job the much-suffering and say, "The Lord giveth and the Lord taketh away. Blessed be the name of the Lord." These are the kind of people that St. Nicholas helps in visible and invisible ways, just as he did when he left the gold for them at night. 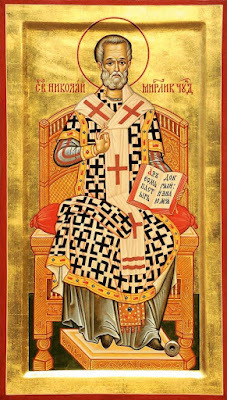 Therefore let us live in hope of God's mercy, through the prayers of the great God-pleaser and wonderworker St. Nicholas. Amen.